Super silent 6 to 100 kVA generator hire serving Hampshire, Dorset, Wiltshire and surrounding areas. 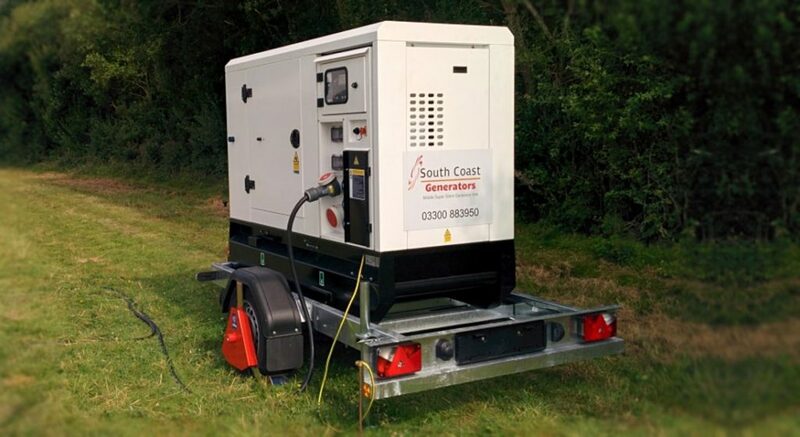 South Coast Generators provide temporary power solutions for any application including festivals, marquee weddings, catering outlets and all outdoor events. South Coast Generators will work out your requirements with you including the size of generator your function requires. Road tow generators are towed to your venue with a 4×4 vehicle. South Coast Generators provide a full installation service and leave everything ready for you to switch on when required! South Coast Generator’s has a comprehensive range of distribution boards, cables and adaptors. All our equipment is fitted with weatherproof plugs and connectors suitable for outdoor use in any weather. All our generators have modern simple to use control panels. Digital displays provide engine and generator data as well as the fuel level. All our generators are super silent models, designed and manufactured for events. Suitable for residential or noise sensitive locations. The 6 kVA’s are single phase 230v. The 20 kVA’s are switchable so can be either single or three phase. From 40 kVA upwards all our sets are three phase. All have a variety of onboard sockets both 230v and 400v. The three phase sockets are protected by adjustable earth leakage devices. Our road tow generators are all fitted with digital control panels with Auto start capability. South Coast Generators can refuel on-site as needed or we can provide external fuel tanks for longer autonomy. All of our sets have a minimum of 24 hours running time @100% load from the internal tank. South Coast Generator’s has large stocks of distribution boards, industry standard rubberised H07RNF cables and adaptors. All our equipment is fitted with weatherproof plugs and connectors suitable for outdoor use in any weather. 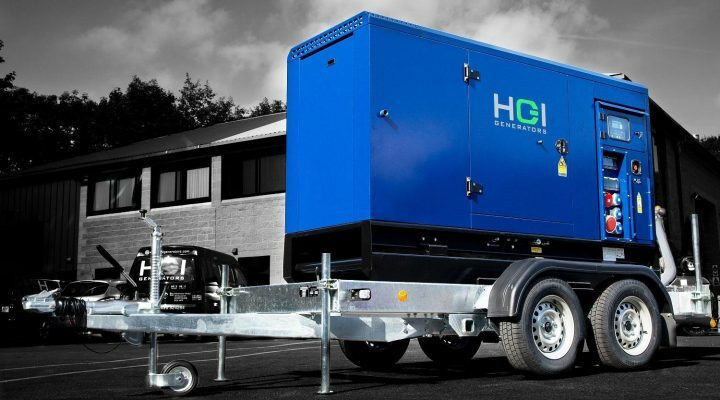 We invest in ultra reliable British made generators from HGI. All our sets are fitted with Stage 3A compliant engines for reduced emissions and serviced and maintained to at least the OEM’s planned maintenance schedule to minimise the chance of any failure and to maximise fuel economy. All the road tow generators have bunded tanks to prevent any environmental pollution. We can supply AMF panels for when two generators are hired in a primary and backup configuration, where the backup generator will start automatically in the event of power loss from the primary set. The AMF panel will automatically switch over to the backup set once it is up and running. When uninterrupted power is mission critical, a pair of synchronised generators is the solution. Synchronisation is available on our generators from 100 kVA upwards. For confirmed generator hire costs please contact us for a full quote. However please see below standard pricing as a guide. All prices are subject to VAT at the current rate. Reliable 48KW super silent generators. Please contact us for hire rates. Reliable 80KW super silent generators. Multiple sets can be synchronised. Please contact us for hire rates. South Coast Generators provide high quality, well maintained power solutions for all outdoor events. High specification generator hire at cost effective prices. For further information or a free no obligation quotation you can use the contact form here or call us on 03300 883950. We look forward to working with you!